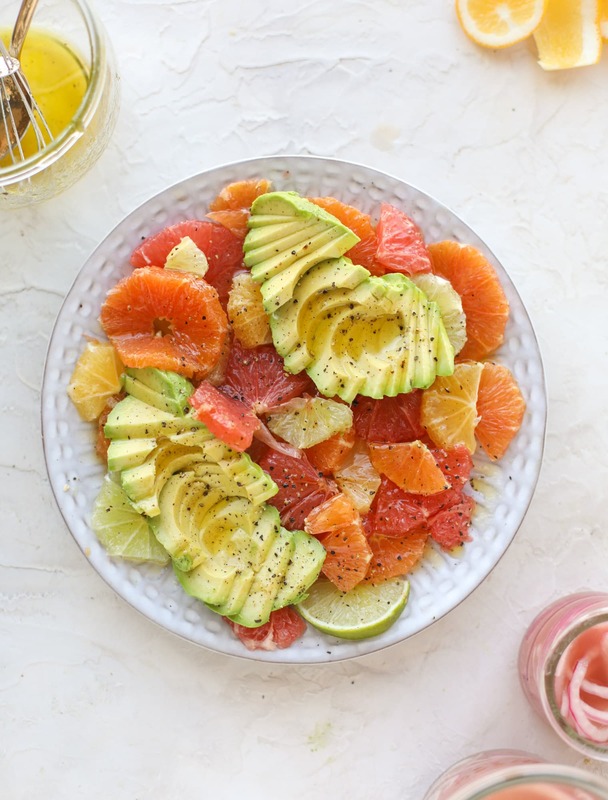 I’m hoping this avocado citrus salad can bring us out of dreary January. Because it’s the longest month ever! Right? In other words, we need something bright. Last week we started with a super traditional, familiar, almost comforting side dish. This week we’re going out of the box! An avocado citrus salad to bring us some sunshine. Juicy, tart citrus. And then, creamy avocado. Tangy pickled red onion. Finished with a honey lime vinaigrette to bring everything together. As a result, this salad is super refreshing. It’s light, bright, tart but sweet from the vinaigrette. And super easy to throw together in these winter months. When it comes to salads, there are entrée salads and starter salads. And then there are crazy salads that don’t have any lettuce and a rely on a base of juicy citrus! Admittedly, this salad is not going to be everyone’s cup of tea. But if you want to celebrate all that citrus season has to offer, it’s perfect. I love it so much with lighter chicken dishes, but it’s by far the best with shrimp and fish/salmon dishes. If you want to serve it for someone who might be like “what the heck” come dinnertime, I suggest starting with only oranges and avocado. You could do cara cara or blood oranges, heck you could even do mandarin oranges drained from juice. It’s definitely a way to get someone interested when the grapefruit or meyer lemon may freak them out. I absolutely love that you can make this dish sweeter (blood orange, meyer lemon) or more tart (grapefruit, lime!). It’s customizable to your palate. And if you’re feeling it, you can throw the whole thing over some greens to bulk it up too! A deliciously fresh and invigorating avocado citrus salad with honey lime vinaigrette. It's creamy, tart, sweet and refreshing! The key here is to use the citrus that you love most! No need to follow this recipe exactly. Layer the segmented citrus, avocado slices and pickled onions on a plate. Sprinkle with salt and pepper. Drizzle on the honey lime dressing. To make the vinaigrette, whisk together the lime juice, honey, garlic, salt and pepper. Whisk in the olive oil until the dressing is emulsified. Drizzle it over the salad and serve! So bright it makes me happy. This is going on the menu this week as a side to shrimp and avocado burritos. Thanks for the idea. So pretty and so refreshing! I love this idea! I love this but I have been striking out on avacadoes lately. Is it me? Is it not avocado season? I usually buy multiple for the week and for the past two weeks they’ve been so bad. it’s not just you! i swear this is the first week in probably two months i was able to find good avocados! i had the same issue, mine would be bad at home too. This seems like a dumb question but how do you cut the grapefruit like that? I have a giant grapefruit tree and definitely going to make this! Brought a big platter of this, along with buffalo wings, to a Superbowl party (balance!). It went over really well. I used a little maple syrup in place of honey (was out) and also added a bit of Dijon mustard to the dressing. I made this last week. It was absolutely delicious. I was worried that my husband wouldn’t care for it, but he LOVED it. We both did. I cut the citrus into supremes or segments, instead of slicing them. The prep took longer, but it was much easier to eat – no citrus pith to deal with. Also, I topped the dish with a few honey roasted cashews. We had this on a cold winter day but this will be a great side in the heat of the summer too. This is the perfect salad for summer. That is the most refreshing salad I’ve ever seen. While your recipients seen to be healthy you don’t specify servings per person portions as this is essential to a satisfying and sensible eating regiment. Why not include per serving rationing?